When people reject what he tells them, Maurice becomes frustrated. But he knows he just has to use another approach and keep trying. For instance now he is putting in park boundary markers and three villages in the south of the park have a different idea of where the limits are located. Local people are not familiar with maps or GPS; they believe that what they approved years ago is different from what is written down. Maurice accompanies them to the field, they have to talk and talk. Lack of education is a real problem. 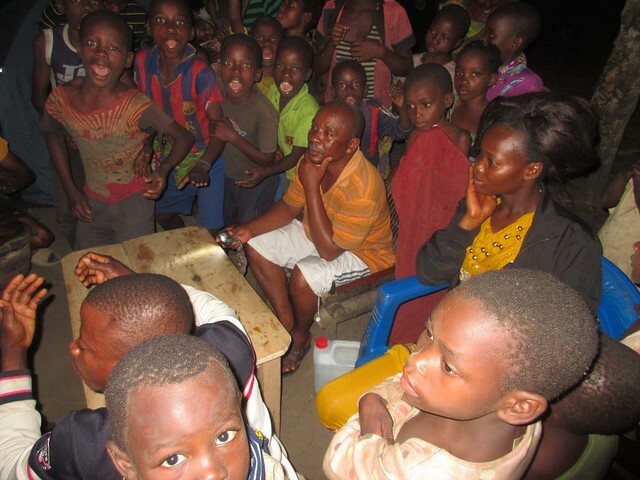 Maurice in a village where he is camped with his outreach team. An example: he saw a hunting camp within the borders of the park, so he went to the village with traditional authority over that part of the park and asked the chief to accompany him. Maurice said “see, this hunting camp is within the border of the park.” The chief said “No! It is not.” There was a long discussion about the need have a place where animals were safe so that they could multiply and move out into hunted areas. Finally, Maurice started to destroy the camp. Then the chief joined him and said: “I will tell everyone in the village not to hunt in the park.” Since then the relationship has been good with that village, and people understand more and more about the necessity of the park where animals can breed without disturbance. When the story ends like this, Maurice feels it is worth the hard work. Maurice was born in 1962 in Monkoto, in Tshuapa Province. This is also where he started to work in conservation. He was a schoolteacher when he met John in 2003. They did village surveys together. Maurice had to learn everything; even the compass was new to him. With time he became an assistant field leader, and finally field leader. In 2007, when John left Wildlife Conservation Society (WCS), he invited Maurice to work for the TL2 Project; he accepted. He moved his whole family to Kisangani so that they would be closer to TL2. Maurice, in 2013, as head of a patrol team. As Maurice grows older, he says that walking long distances day after day in the forest becomes harder. He has always liked working with local communities, so the switch was easy. 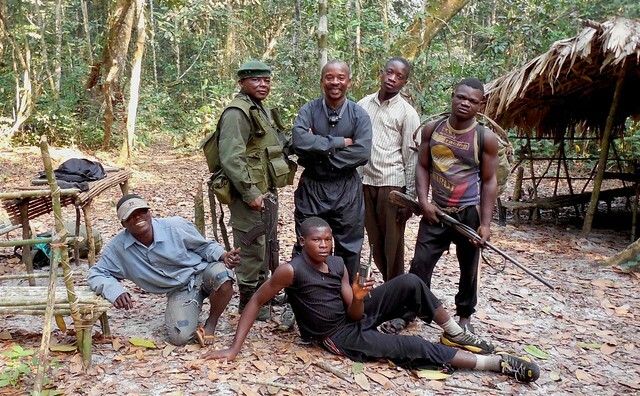 He visits the villages in the buffer zone to educate people about the importance of the park, sustainable hunting, protection of bonobos, and the alternatives to hunting for making some cash. He organizes village meetings, sometimes shows films and sometimes does community theater. He enjoys learning community problems and trying to find solutions together. This is what keeps him going. Maurice showing a film to villagers about the importance of the park. In the future he hopes to build his teams, so that they can cover the whole buffer zone around the park. Maurice has 7 children. He will make sure that all of them get a good education. He doesn’t want to force them to become something they don’t want, but he tries to teach them about the basics of conservation, because as he says: “Conservation helps in everyday life. 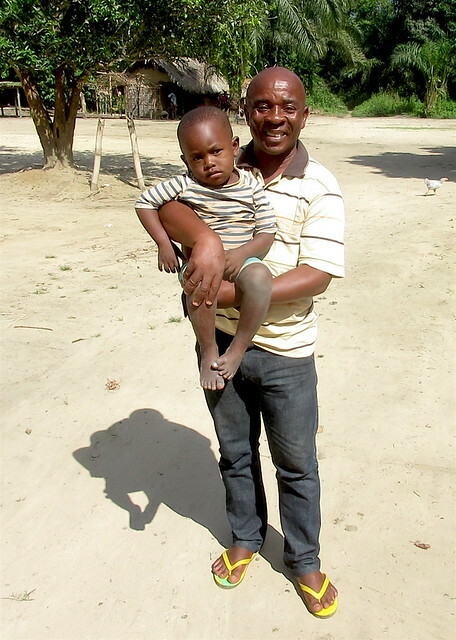 For example if we cut all the trees, it will be hot.” His eldest son studies renewable resource management at the University of Kisangani, and Maurice is happy that at least one of his children will follow him in working for conservation. When he was a kid, his father was the administrator of the territory, just after independence. Maurice remembers that his father found conservation important. He had poachers arrested, and Maurice even has a vivid memory of a man with the dead body of a bonobo. The man was arrested that day. Then the adults carried the bonobo carcass home, and Maurice and his brothers and sisters were all afraid, because the body looked like a human. He doesn’t remember what happened with the body, but he is sure they didn’t eat it. He wanted work that continued his father’s respect for nature, but he didn’t have the chance because his father died. Without support he decided to become a teacher, because studying to become a biologist or doctor – his dreams – would have cost too much money. He is very satisfied with his life: in the end he could get into the world of conservation just like his father did, and he can even use the knowledge from the time when he used to be a teacher.